The wrong values — or a mistaken approach to them — can really stunt our growth. 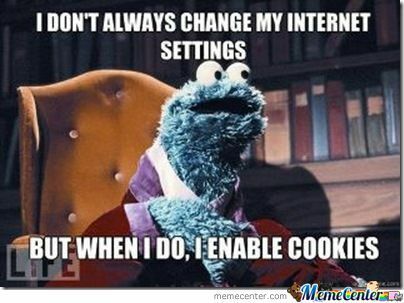 I can attest to that. But understanding how values really work will help you make better decisions at home and at work. A FEW YEARS AGO I found myself in a rather dark place. The bottom had dropped out from under me in several areas of my life. It started when I stopped believing in the religion I grew up in, got worse when I moved across the country and realized how naive my world view was, and got even worse when my marriage fell apart and I found myself temporarily homeless and scraping my livelihood back together. Whereas I was once a trusting and conscientious person, now I was inwardly cynical and suspicious. I no longer believed in anything, or in anyone. After a period of self-loathing and reckless escapism from the resulting existential dread, I decided that I needed to start being an adult and make good choices again. I had a business to run. Friends to support. A family to reconnect with. Talents to not waste. Operating without trust or principles was not turning out great. The problem was, I realized I didn’t really have a system to govern my behavior. I didn’t have any underlying rationale for why I thought being kind was important or that lying was “bad.” Were they? Did it matter? As I started getting myself together, I was confronted with questions like this a lot. How was I going to live my life, now that I was going to be deliberate about it? After a few more years of trying to be good and floundering, I finally decided to tackle the hard questions around my behavior—What should my values be? And how do values work anyway?— by going on a journey through history, philosophy, psychology… and Latin America. So about year ago I bought a plane ticket to the Southern Hemisphere to start figuring things out. I wanted to think and work on myself from a sort of blank slate, in an environment free from the distractions of home. I went back and forth between home and Brazil, home and Mexico, reading up on the values of every world religion while I was away. I dug into the history of existential philosophy. I pored through scientific literature on moral foundations. Eventually, I even read (most of) an 800 page textbook on Virtues and Character Strengths. I came back home for some work and left again (this time with a serious romantic partner—yes, life was getting normal again) for another 6 months of reading and personal writing around the world, including a brief stay with some monks in the mountains of Japan. ON THIS JOURNEY, I wrote about the power of love and self-compassion for post-traumatic growth, which was a particularly helpful lesson for me. I also delved into and wrote about the power of personal rituals for behavior change, getting to know and overcoming your ego, how to overcome self-deception and intellectual dishonesty, and documented my ongoing studies on virtuous character and the power of intellectual humility. Through all this, I believe I’ve gained an understanding of not just what I want to have as my Values for governing my behavior, but also how values work. This has helped me enormously. I now feel like I’m living a more deliberately. I’m not perfect. I still have a long way to go. But I have a reason for why I choose to behave the way I do. And I feel great doing it. I think these things I’ve learned can help anyone live their values a little better, regardless of what religion (or lack thereof) you subscribe to. And as a happy coincidence, this work has also helped me rethink the role of values in organizations and society as well. Because it turns out that what most people get wrong about values, most groups get doubly wrong. And just as gaining a strong underpinning of what values mean could help unmoored people like me feel better about the way they live, so can smarter values help neighborhoods and countries and companies work better together. What’s the difference between Values, Principles, and Virtues—and where do they come from? What Are Values, Principles, and Virtues — And Where Do They Come From? Values are things we care about so much that we put them above all other things. They help us choose how to behave. Values are about trade-offs. Something is valuable if it costs you something. That something could actually be money. But it also could be time. Or relationships. Or any other opportunity cost. Valuing something means giving up other things, even good things, if it comes to it. You can tell what you actually value by your actions. A lot of us say we value things — say, honesty — but if you fudge a little on your taxes, you actually value money over honesty. Some people have values that they have decided they will never, ever trade off on. These are called “Protected Values.” They can be problematic if they leave no room for judgment based on the situation. So it’s important to choose these wisely. Most people, in contrast, have only a pretty loose grip on their values. We often form them subconsciously, between our individual biologies, personalities, and life experiences — including the experience of being taught values by authority figures. Because so much of this is subconscious, many of us have a limited grasp of what our values actually are. Much less, why. We don’t explicitly think about our day-to-day behavior in terms of values or where they come from. And we usually don’t rank our values in terms of which are most important. So when two values conflict, things get weird. People: Families often value their members enough to put them over their neighbors. Nordstrom values their customers enough to lose more money on their return policy. America values citizens enough to give them more rights than non-citizens. The State of California values state troopers more than state teachers, according to data on how much it pays each of them. Stuff: Jon Bon Jovi values his guitar (one assumes). I value my stuffed walrus named Walrus enough to save him first if my house was on fire. Some people value their time enough to say no to things that others don’t. Outcomes: Many people value success enough to spend more time on it than they do on their families. A lot of companies value growth over things like work-life balance, (despite what they say). Behaviors: Many people value being obedient to authorities over doing what they want to do themselves. (This can be good or bad, depending.) A lot of companies value working hard over behaviors like having fun or doing what you’re told. Traits: Many people value beauty or charisma, and will spend more time with people who have those traits than others. Basketball teams value attributes like height and shooting skill over, say, extroversion. All things being equal, they’ll choose the tall, shy guy over the short, charming guy. When we talk about values, we often conflate all these things. Value systems end up having apples and oranges and bananas and pineapples in them. You might value your family and success and your time and working hard and having fun and beauty. Principles help us figure out how to act. Think of them as the best kinds of behavior-drivers. They’re less rigid than “protected values” or specific behaviors—because they’re abstract enough to help in trickier situations. For example, “Do unto others as you’d like them to do to you” is a Principle. When you’re faced with a choice, you can filter your decision through this. How would I like to be treated? This is more helpful than saying something like, “I value other people.” That’s nice, but the Principle “do unto others” is more helpful when you have a choice to make. Virtues are traits that make up who we are, and can help us determine our principles that guide our behavior and other things we might value. The research on Moral Virtues and Moral Foundations answers one of my first questions: It turns out that everybody (who isn’t a psychopath) feels like Kindness is good. Whether you believe God or evolution put that there, it’s still the same: we’re built to feel certain things are just plain good. Not everyone has the strength to do those good things. And some of us try to rationalize why we shouldn’t. But we all feel it. And they (Virtues) are all helpful—especially when taken together. 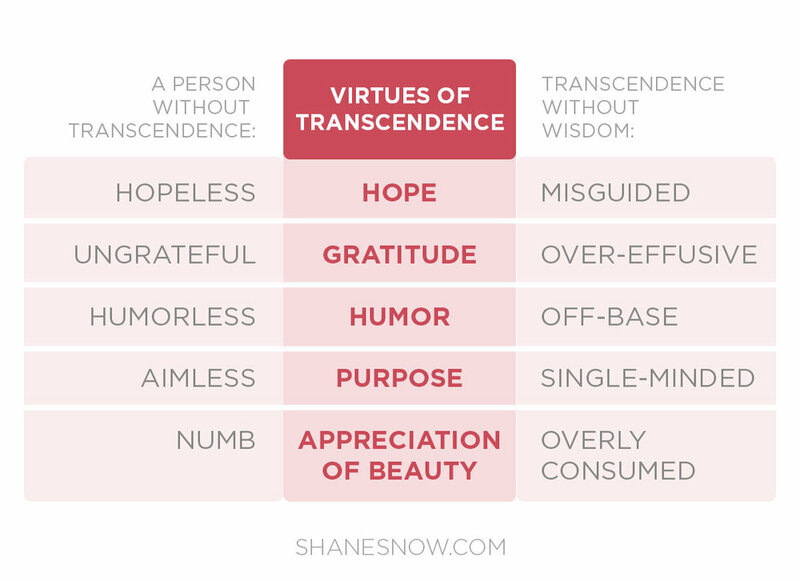 As the chart below makes clear, Virtues are the most useful type of Value. If we care about Virtues enough to develop them, we’ll be able to create Principles that help us choose the things we value and adapt as we live our lives, rather than living laissez faire or picking Values based on gut. Develop Virtues, and use those to help us determine how to behave on an ongoing basis. The last one is hardest, but the only real way to be deliberate and effective about your values. The key to making good use of Virtues, as is hinted in the big Virtues chart above, is developing Wisdom (and Perspective in particular) to help you turn your Virtues into Principles, or rules for living—which aren’t so concrete or fixed that they actually prevent good behavior or adaptation (or provide too easy a way out of hard questions). So is it enough to just say you value all the Virtues on the list above? Not quite. As usual, things are a little more complicated than that. But when we dig a little further, we’ll see there’s a simple way to get to the end of this tunnel. VALUES ARE COMPLICATED. FOR several reasons. The first is the apples and oranges thing. Different things we can value fall in different categories, and that makes things confusing. When two people hear the word “values,” one might think of “traits” while another thinks of “behaviors” and another thinks of “stuff.” And all of us “value” things in all these categories. As we discussed, this makes it important to have higher values that determine our other values — i.e. virtuous traits that prescribe principles of behavior that help us do (and value) good things. The second thing that’s tricky about values — even ones rooted in moral virtues — is how often values are unhelpful. For example, valuing “being patient” can often help us make good decisions. But, despite the saying, patience is not a virtue. Sometimes being patient is bad. When a shark is about to bite your friend in half, being patient is very clearly the wrong thing to do. Furthermore, in life we often face decisions where two principles conflict. If you value the principles “be kind to animals” and “protect human life,” what do you do when the only way to save your friend from a shark attack is to stab the shark with a harpoon? And whereas moral Virtues are good in and of themselves — almost every human agrees that “kindness” is a good thing, for example — just because a trait is never morally bad does not mean it is always the most helpful in every situation. In the shark dilemma above, you can’t really operate with kindness toward both the shark and your friend, can you? Kindness will not get you out of that scrape. IN OTHER WORDS, VALUES often only make sense in the context of other values—specifically Virtues. Valuing outcomes like success only really make sense when paired with Virtues like integrity. Otherwise we get Enron. (Which, ironically, had the value of “integrity” written on its headquarters wall.) Justice can be barbaric if it’s not tempered by mercy. Otherwise we might a high school bully in the same way we would a murderer. When two Values conflict, we have a dilemma. Virtues can often help solve these dilemmas. But even groups of Virtues can conflict. When that happens, it’s called a Moral Dilemma. Rank your Values in order of importance. Rationalize a way to make it not a dilemma. Defer to an authority to make the decision for us. Use the Meta-Virtue of Wisdom, which taps into all Virtues, as a filter to make the best choice. Without Wisdom, any Virtue will cease to be a Virtue. This is why I call Wisdom the Meta-Virtue. And it’s also why the ancient Greeks said it was the main virtue that mattered. Since Virtues are all good, it’s admirable to try to develop them all. This way you can have the biggest toolkit for making wise choices. And this in turn highlights why Wisdom is such an important Virtue — it taps into each of the other Virtues. Now it may be tempting to dismiss certain of the other Virtues (or their Moral Foundations) as less important than others. But that’s not a great idea, because the whole idea of Wisdom is that depending on what you’re trying to do at a given point in life or work, you may get more value out of certain Virtues and Principles than others. For example, as an adult you may decide you want to govern your behavior using “kindness” more than “leadership.” But you probably want your child to prioritize “leadership,” since parents and teachers are wiser than a child and can help it make better decisions. A company that is in the creativity business might rightfully value the Wisdom virtue of “creativity” more than “self-regulation.” A society that no longer faces existential risks might start to value “mercy” and “kindness” over “fairness,” whereas a society with scarce resources for survival might rightfully prize “fairness” over other things. In any case, Wisdom is the big one. Wisdom is about continually taking new perspectives, continually learning and being creative, and having the intellectual humility to change course when needed. But even Wisdom needs moderation from other virtues. So the more you develop other virtues, the more Wisdom you’ll have. One of the sub-Virtues of Wisdom is Perspective, which is about gaining understanding from different viewpoints. Therefore, it is wise not to ignore perspectives—even if we don’t agree with them. And that means that even people who don’t have what we think are good values, or at least who don’t share our values and understanding, are important. So whereas I believe that Wisdom should be the #1 value on everyone’s list, part of having Wisdom is not shutting people out if they disagree (or simply think different). A study of all of these makes it clear that Wisdom is the most important no matter what system you subscribe to (or if you want to build your own value system) and that part of Wisdom is knowing you don’t know everything. So I have concluded that everyone who wants to live a deliberate life ought to work on the four sub-virtues of Wisdom first and foremost. I’M ARGUING THAT DEVELOPING Wisdom should be our priority, so we can adapt to our changing world and the ever-changing knowledge we learn. But at any given time, the reality is that we will place value on things. And sometimes we’ll have to make decisions quickly, without time to really exercise Wisdom. A lot of living a life of values is about going back and reflecting on past decisions using the Wisdom we have now, and determining what we will do next time. In other words, it’s okay to have a set of values, so long as that system isn’t fixed. In the parlance I introduced earlier, we don’t want Protected Values. This is the big problem with a lot of value systems we see in organizations — they don’t leave room for adaptation through Wisdom. Work on developing the meta-virtue of Wisdom. Then work on developing the other 6 categories of Moral Virtues, and valuing them underneath Wisdom. For when you’re in a pinch, you can rank order the virtues you value more than others. If you’re going to do this, do this periodically, like at New Year’s or something. Ranking these things can be useful, but it can also cloud our judgment if we turn this stuff into Protected Values, meaning there’s no room to change in light of new information. But if we’re able to remember to use Wisdom, then ranking our values can be a good way to live our lives in a pinch. When situations arise, determine if it’s an emergency. If it’s not, step back and think it through with Wisdom: Look for perspectives, try to learn, be intellectually humble about what you think and allow yourself to be wrong, and be creative when you can. Apply each of the other virtues as filters before making a decision. When a situation is an emergency, err on the side of Courage: Use integrity (in the parlance of The Four Agreements, be impeccable with your word), be brave in the face of fear, and endure discomfort. After exercising Courage, err on the side of Humanity: Be kind if you can’t find a way to be both kind and fair, show mercy if you can’t both be merciful and just. Operate with a bias toward hope, purpose, and gratitude (Transcendence). After looking out for Humanity, look after yourself (Temperance). Then do your best to be fair, to lead with your example, and be a good citizen. Like I said, I’m not perfect, but these Principles are a start. And all this makes me motivated to understand and develop the underlying Virtues behind them. I don’t think it would be bad if you did that, too. But we’re all different, and for that reason, I think it’s important to end this post with one last bit about the role of groups and our potentially different values. Finally, I want to talk briefly about how this understanding of Values plays out in groups, companies, etc. Whatever the group authority wants the values to be. When an authority figure sets the values of a group, be wary. The difference between a cult and a healthy culture is the amount of tolerance for difference there is. Because different people may by nature have different Values, a healthy group ought to be okay with different Values—so long as they don’t infringe on tolerance itself. In other words, a healthy group will have a shared devotion to a purpose and tolerance for everything but intolerance. And that’s how a group with diverse Values is totally fine, useful even. With the exception of, you guessed it, Wisdom and the other moral virtues, telling a group what they need to value actually puts the group’s decision making and inclusion at risk. Excluding people who don’t have certain values by nature decreases the perspectives you have available to you, which makes you less wise as an organization. Besides, what are you really trying to do when you impose a set of values on your group? Are you trying to bind a group together? Great! Emphasize a shared purpose instead of shared ways of thinking. Create rituals that build camaraderie. And let people be themselves. Are you trying to encourage certain behaviors? Ok, but think hard. Are these behaviors that might exclude valuable perspectives if you are strict about them? If so, skip em. Instead, encourage your group to develop Virtues — all the “no duh” things that make a person better. For the same reason that most people aren’t able to make effective use of Values, most groups end up with lists of Values that don’t work for them — and in some cases, actively hold the group back. A big reason for that is a lot of groups think of Values as a sort of “wishlist” of things that the group doesn’t have, but its leaders wished it did. Enron’s values included “Integrity,” “Excellence,” and a bunch of other nice sounding things. The more diversity of thought we consider in a decision making process, the better chance we have of making the best decision. And diversity of thought often comes with diversity of individual values. That’s what Perspective, the sub-Virtue of Wisdom, is all about. If there’s any conclusion I’ve taken away from my study of Wisdom and Virtues, and all the philosophers and religious leaders who’ve espoused them throughout history, it’s this: Human beings are inherently Valuable, and a wise person will appreciate what each of us can bring to make us all a little better. My theory is we should live like we believe that. Shane Snow is author of Dream Teams and a global speaker on innovation, collaboration, and becoming better together. Get his monthly newsletter here.